Imagine that you are under the umbrella of a bear... Under his protection, his guard! Well it's not imagination! We are under the bear's umbrella. The title umbrella specie is a very honorable and important one. The bear being umbrella specie means that every living organism in its environment depends on his presence. And so it is. Large predators are keystone species in ecosystems around the world. The presence of them provides the right circumstances for all other organisms to flourish. 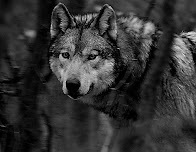 In Europe's wilderness we have 3 large predators: The Eurasian lynx (Lynx lynx), de European wolf (Canis lupus lupus) and the European brown bear (Ursus arctos arctos). 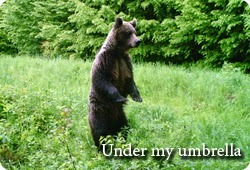 Being the largest and most powerful and versatile of them all, the bear is umbrella specie. The lynx and wolf are keystone (or cornerstone) species. The wellbeing of an ecosystem is entirely depended from its keystones and its protecting umbrella. When keystones disappear, collision will occur. Therefore all flora and fauna depends on these species. Herbivores will stay on the same place until all the food is eaten. Then they move on, leaving flora in a stage of destruction, causing very slow recovery. Some flora species won't overcome this and die out. Smaller predators like fox, jackal and wild cat will advance in numbers, since they have no enemy. That will cause massive predation on small mammals, birds, reptiles and amphibians. Some important species among these prey animals won't overcome this and die out. Insect populations like mosquito which are hunted by smaller animals will flourish and cause a lot of problems like the of spread diseases. Important insects and eventually micro organisms like bacteria's will disappear, etcetera. At the end of the ecosystem collapse, all species that are important for balance and biodiversity will be gone. Leaving behind a malfunctioning shell of nature. Conclusion of this all: large predators are the safe keepers of the ecosystem! Their presence protects all key species, bigger and smaller, flora and fauna. They even safeguard our wellbeing... The quality of nature provides oxygen. We can't live without it. The tasks performed by large predators cannot be taken over by humans, no matter how hard we try or even think that we can. They are the real wildlife managers. The key to success, therefore, is not full management of nature or ecosystems, but safeguarding and conservation. When we focus on that, we have a future and we'll be under the bear's umbrella. That's why Canine Efficiency is devoted to safeguard, protect and enjoy nature!